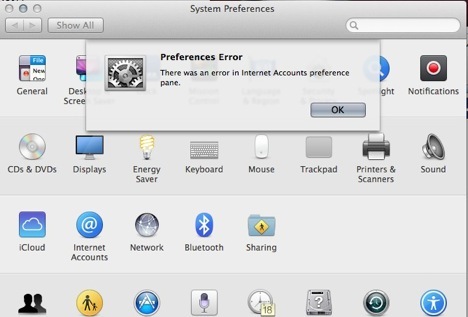 There was an error in Internet Accounts preference pane. followed by emptying my recycle-bin and restart the computer, but the problem persists. So I attempted to setup the account in Preferences>Internet Accounts again but this time, I started the process with all of my internet connections disabled. So I disabled the wifi and ethernet adapters beforehand. 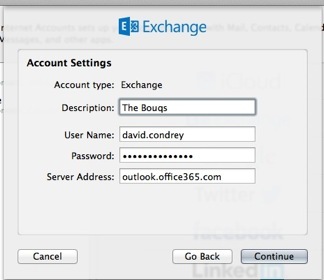 Now, when after entering my info, and selecting continue instead of crashing it displayed a new window requesting that I manually enter the server address. I manually entered the server, reactivated my network connection, and selected continue, at which point it completed successfully. The problem must be that when the system attempts to find the server automatically it fails to find it, and rather than request it manually, it crashes. But if there is no internet connection its forced to request the information since it is unable to search for it. Not the answer you're looking for? 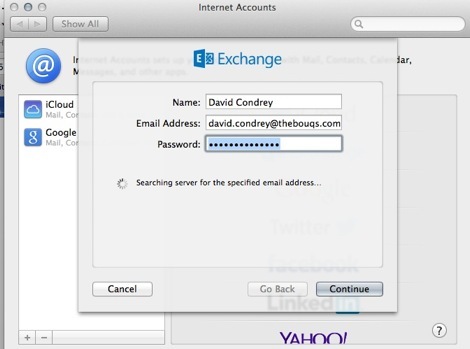 Browse other questions tagged crash system-prefs accounts exchange console .